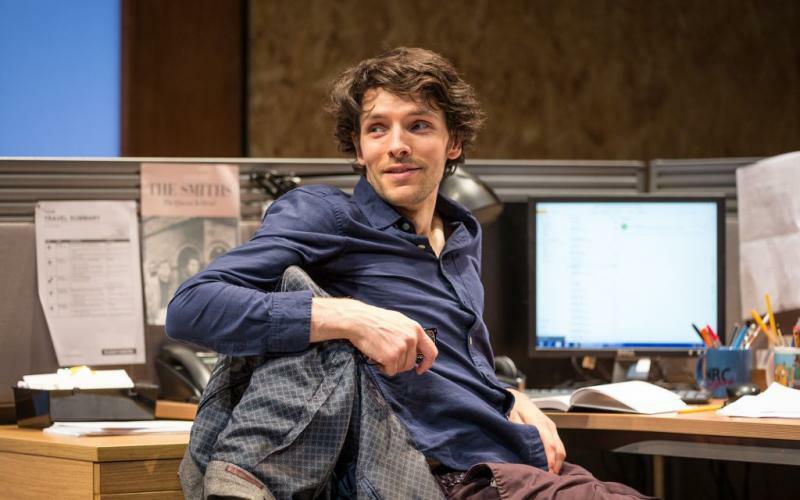 The thing that swung this production, aside from the fantastic writer that is Brandon Jacobs-Jenkins, and a great cast including Colin Morgan, was the news that the Hampstead had sealed bits of their programme to protect spoilers. Though I admit to be slightly unnerved by the instruction to let an usher use a knife on my programme at the interval…. Gloria. Who is Gloria? well in the spirit of the Hampstead’s extreme spoiler tagging this post will remain major-spoiler free. To that end then Gloria is the slightly downtrodden employee of a magazine, the longest serving assistant amid a pool of cynical younger assistants. 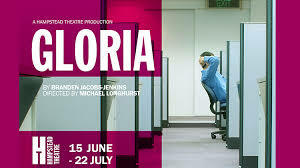 Gloria eventually becomes the centre of some shock waves that rip through that pool of assistants, and give us some insight into the modern world, and the makings and marketing of, well pretty much event. The editorial team, led by Colin Morgan’s Dean- senior and long serving assistant to Nan. He arrives dishevelled and hung over, having been at Gloria’s party the night before. Cynical, jaded but harbouring secret literary ambitions, he’s derided by the younger assistants Kendra and Ani. Meanwhile intern Miles sits quietly in his own corner taking in a world he’s not even sure he wants to be part of. 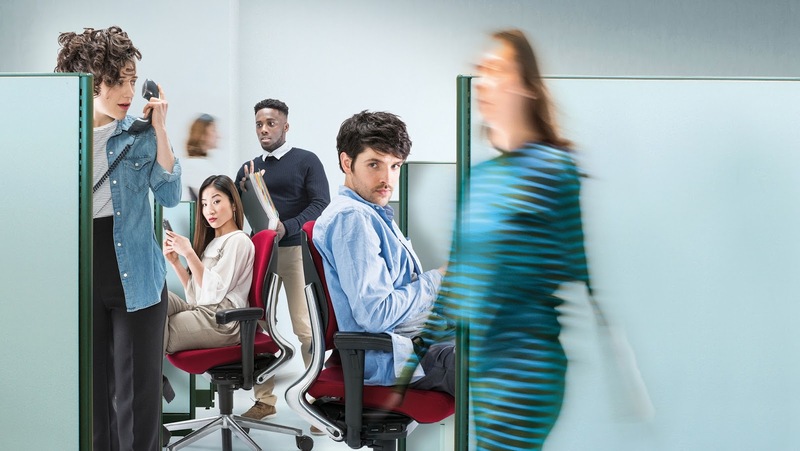 Act One wouldn’t be out of place in any television drama or sitcom- group of twenty somethings in an office, struggling with the changing world around them. I’m loathe to utter the word ‘Millennials’ but the changes in the publishing industry, and the difference between the world their bosses came of age in and their own working life are palpable. There is talk of five year plans- or lack of them- and secret ambitions. There’s a fission of jealously when the intern seems to get on swimmingly with unseen boss Nan. There’s resentment of Kendra’s seeming lack of work, and Ani’s seeming ease of getting any other job she’d like with her computing background. Meanwhile Dean’s frustration at having stalled in one job at almost 30 and his frustrated literary ambition. So far so 20-something drama. But even without the shock ending to Act 1 that catapults everything up about 10 gears, it’s much more than the cubicle bitching and office dramas. It’s the sharp eye for the world around us, and a way of capturing that awful ‘Millenial Experience’ and ‘Modern Life’ that many a magazine article ironically fails to do. There’s a deft awareness of the undertones of the society we live in brought out by these characters. From the sharp references to privilege of different kinds, it’s a sharp observation of heirarchies of subtley at work. It’s an impeccably presented production. 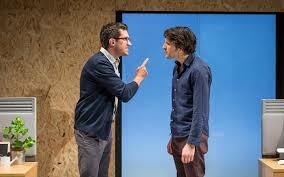 Colin Morgan is endearing at Dean and provides a strong centrepoint for the cast. His second act appearence as Devlin is also one not to be missed for sheer power of costume and wigs. There is much doubling across the second act, cleverly cast and cleverly dressed/wigged in a production that is slick and cleverly staged. 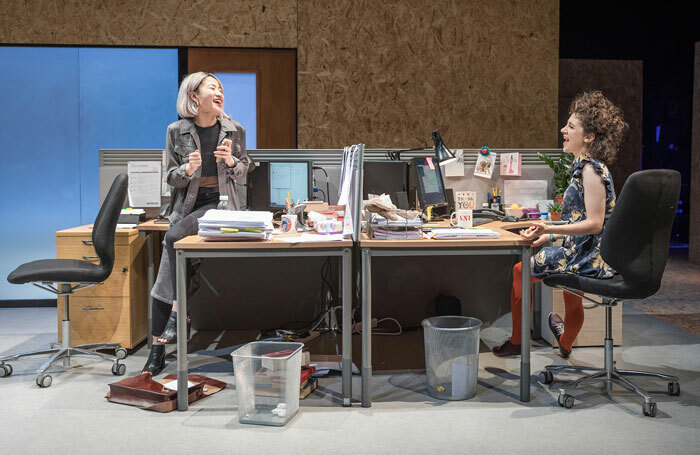 Of the rest of the cast Sian Griffiths and Kae Alexander rise to the challenge of their varied roles, and are utterly convincing, entertaining and unsettling as requried. Underrated and in the play purposefully unoticed is Bo Poraj as Lorin. Who provides an emotional footnote at the end of the play. Gloria will be talked about for the shocking end to Act 1. And the staging and the unapologetic manner in which such a moment is depcited is in itself to be applauded- the world we live in is not one in which theatre should shy from such moments. However it’s the sublties of the buildup and the fallout that Jacobs-Jenkins should be appluaded for. His is a shrewd observation of the modern world which is realistic without resting on cliches. It is a sharp, often witty and always engaging world in which we see our darker edges reflected back. Until 29th July Hampstead theatre London.